One of the best-loved Christmas carols is Joy to the World. The song begins with “Joy to the world, the Lord has come; let earth receive its King;” and then we sing, “Let every heart prepare him room.” Prepare him room, it says, or, make room for Jesus. The phrase brings to mind that very first Christmas when there was no room in the inn– no room, not even for a woman about to give birth. Imagine that, the Son of God, here to visit his own creation, and there is not even room for him to be born. How about for you? The hymn seems to ask, “Is there any room in your heart and in your life for this Lord?” He came for you– do you have any room for him? “Joy to the world,” we sing, “the Lord has come; let every heart prepare him room.” No room in the inn for a pregnant woman about to give birth to the Son of God? How outrageous! But is it any less outrageous that God himself wants to be with little you, has come to earth to live a life like you, has died for you to forgive you of all your sins, has risen from the dead for you so that you too may live forever– all that for us, and we have to be told to see if we can make a little room for him in our busy lives! Every detail of this story as it is told in the Gospels is significant, and the fact that there was no room for Jesus in the inn is also symbolic of the many people in the world who still have no room for him. And the fact that Jesus was born in the poorest and humblest of circumstances is also symbolic of the fact that throughout history it has been the poorest and humblest people who have been most willing to make room for Jesus. It was among the slaves and lower classes that the early church took root and grew most of all. Today it is among the poor of the Southern hemisphere that the church grows by leaps and bounds, while in the wealthier countries of Europe and the United States the church is in rapid decline. There was room for Jesus in Bethlehem on that first Christmas, but not in the busy comfort of the inn. Rather, it was out among the cattle in the stable, where many necessities were lacking, and there were many dangers for a newborn. The same is true in our lives. The more comfortable we are, the less likely we are to make room for Jesus. It is when we are in discomfort or despair or anxiety or hopelessness that we are most likely to remember Jesus, and remember to make room for him in our hearts. Best of all, of course, is if we do not forget Jesus in our good times; then when hardships do come, Jesus can be there for us like an old friend. When I was in college in the 1970’s I was assigned to read the book Future Shock, by Alvin Toffler. The book has a chapter on what Toffler called “over-choice,” in which he predicted that in the future there would be so many choices for pleasure, communication, entertainment, travel, education, television, leisure, fitness, sports, and so on, that all these many opportunities would become no longer something positive, but a source of frustration. People would have so much and do so much, and still feel like they were missing out on something, because there would be still so much more to be had. Well, that future is here. Our lives are incredibly full compared with even a couple generations ago, and we are still frustrated and anxious. 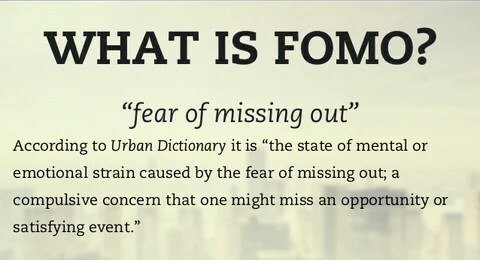 There are even words now for this condition– FOMO– Fear Of Missing Out; or if you are older, FOHMO– Fear Of Having Missed Out. Now, with all these wonderful choices available, fewer and fewer people have the time or energy for what Jesus called that “one thing needed.” Jesus said that to Martha who was so very busy with so many things that she did not have room in her schedule for Jesus, even though Jesus was making a personal visit in her home that day. With practice, such simple prayers can become a habit, and then you will be, in fact, preparing room in your heart for Jesus; and you will grow in faith, and then experience more and more that joy that has come into the world in Jesus.